I’ve realised that the older I get, the more obsessed I’ve become with my skin. When I was younger, I used to be able to get away with bad eating habits and a non-existent skincare regime. Moisturisers? Bah, who needs that. Sunblock? Only for sissies. Now, even one less hour of sleep shows up in the form of dull, tired skin and dark eye circles. So like millions of women around the world, I cheat. Short of plastic surgery, I find myself drawn to products that promise brighter, glowing skin. This what I ended up looking like last night. With no time for a facial, I tried the Kose Seikisho Mask White for a quick fix. This is a product that promises to unclog pores, remove dirt and reduce blackheads. And I must say I’m quite impressed. Even though it says "mask white", the actual product is a thick, gooey black paste. You spread a thick, even layer on your face, wait about 20 minutes and then you peel it off. What the packaging doesn’t warn is that peeling the mask off hurts like hell. At one point, I panicked because I had stupidly spread the mask over my eyebrows and I thought I might have stripped my brows clean. But after getting the mask off, my face did look considerably brighter and cleaner. It also felt smoother. Not bad for a DIY facial. It’s priced at S$34 but John Little is having a buy-1-get-1-free promotion so that works out to about S$17 per tube which I think is a good price for a deep-cleansing mask. 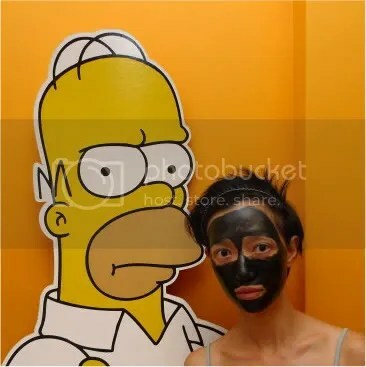 Now, if only they made a facial mask a bright Simpsons yellow!